Sandra Korn '14, a leader for the Responsible Investment at Harvard Coalition, speaks to protesters gathered on the steps of Widener Library on Friday afternoon. 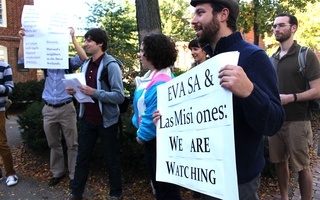 The rally protested Harvard's management of its timber plantations in northern Argentina and ended in a protest in front of Massachusetts Hall. UPDATED: April 16, 2014, at 5:22 p.m. The Responsible Investment at Harvard Coalition held a rally Friday afternoon on the steps of Widener Library and Massachusetts Hall to protest the University’s management of timber plantations it owns in Argentina. The rally comes after much debate over the plantations, including allegations of mismanagement in the fall and the announcement of the independent recertification of the plantations last week. After several members of the Harvard community, including the Undergraduate Council President and a Harvard alumnus working on the City Council, spoke to the protesters gathered in front of Widener, the group marched to Massachusetts Hall, which houses the University’s central administration and President Drew G. Faust’s office. A delegation from the group entered Massachusetts Hall with a petition containing 1,150 signatures, formally asking Faust to change the University’s management of its plantations. 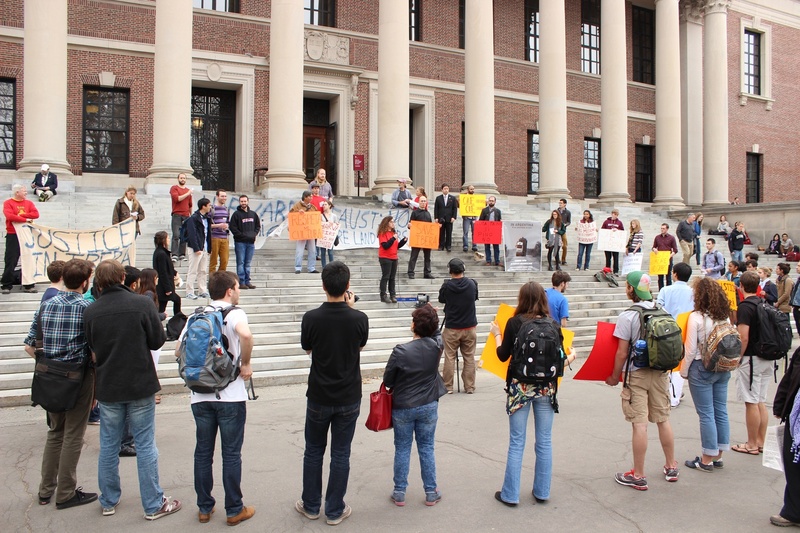 The protests were a part of Responsible Investment at Harvard Coalition’s week-long SHAME Tour, which seeks to “stop Harvard’s Argentine mismanagement and exploitation,” according to the organization’s website. As part of the demonstration, the coalition flew two leaders from local communities in Argentina, Adrian Obregon and Emilio Spataro, 4,884 miles to Harvard’s campus. Responsible Investment at Harvard is a coalition of students, alumni, faculty, and community members dedicated to changing the way the University manages its investments, according to its website. Members of the coalition argue that Harvard’s unjust practices on the Argentine plantations include devastating local farmers, harming workers, and destroying wetlands. Harvard Management Company has denied those accusations in past memos and statements. And in an April 16 op-ed, HMC’s head of alternative assets, Andrew D. Wiltshire, wrote that claims made by Responsible Investment about the plantations “show a clear pattern of deliberate misrepresentation.” Wiltshire specifically contested claims that the Harvard-owned companies harm workers, the wetlands, or, in any significant way, the environment. He also reiterated that HMC is working with locals to implement recommendations that the Forest Stewardship Council certification process requires. UC president Gus A. Mayopoulos ’15 spoke at the rally, voicing his support for the coalition’s efforts. The UC will be hosting a forum on responsible investment with Obregon and Spataro on Tuesday. “It is unfortunate, it's sad, and it's embarrassing that Harvard is choosing to fund these efforts by damaging a community," Mayopoulos said. Cambridge City Council Member and Harvard Kennedy School graduate Leland Cheung also spoke at the rally. "I'm proud to be a Harvard grad, but there's so much that is making me ashamed," Cheung said, citing both the campaign for divestment and the recent unionization movement of DoubleTree hotel employees. "It's not enough to try to educate students to go out and change the world when Harvard is going out and damaging the world," he added. In addition to the protest, Responsible Investment at Harvard has already hosted several events, including one in New York and an event with the Harvard Kennedy School Progressive Caucus. 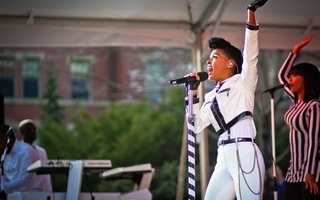 —Staff writer Kristina D. Lorch can be reached at klorch@college.harvard.edu. A study released Tuesday alleges that the management of two Harvard-owned timber plantations in Argentina has led to the deterioration of the Ibera Wetlands, the world’s second largest wetlands, and a decline in the quality of life in surrounding communities. Harvard could continue to cut corners, sacrificing native forests, subsistence farmers’ land, and ecological well-being in its efforts to turn a profit. Or, it could use its timberland assets to push forward a sustainable model for global forestry. I hope Harvard takes seriously its “commitment to sustainable investment” and that its “distinctive responsibilities to society” lead it to responsible ownership. Being a student at Harvard is an incredible privilege. The least we can do is listen to those who are harmed in Harvard’s name, and work to make Harvard a positive force in communities from Cambridge to Corrientes. Though plantations can cause negative impacts in some cases if poorly developed or located, with care and attention to planning and management, benefits should far outweigh the costs.